Asthma hospitalization rates for Canadians younger than 20 have declined by 50% over the past 10 years. Yet asthma continues to be one of the leading causes of hospital stays among children and youth. One of CIHI’s new reports — Asthma Hospitalizations Among Children and Youth in Canada: Trends and Inequalities — looks at socio-economic inequalities in asthma hospitalizations. How do income and education affect asthma hospitalizations? 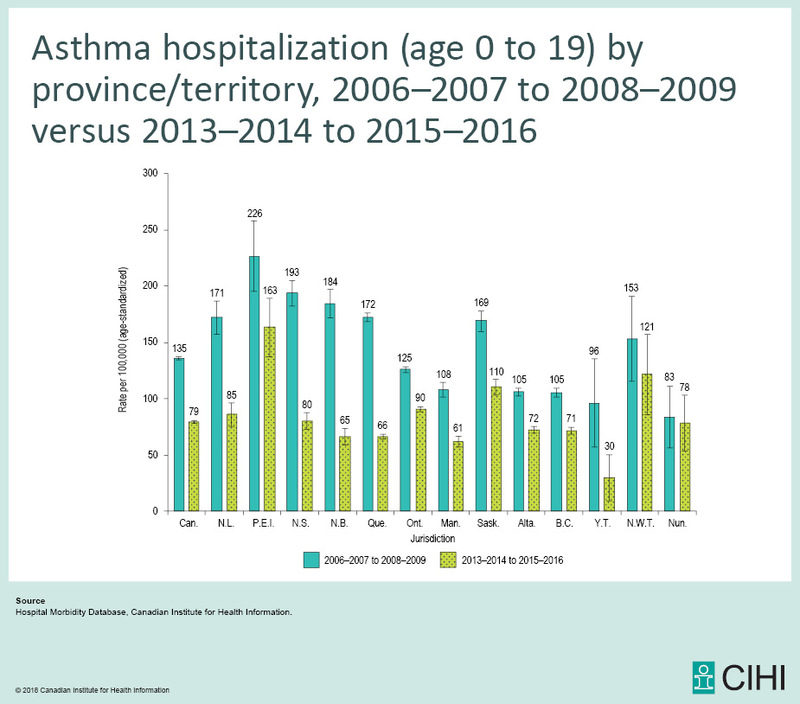 We worked with Statistics Canada to apply newly developed equity stratifier definitions to CIHI and Statistics Canada data to uncover which populations are experiencing higher asthma hospitalization rates than others. This analysis revealed that children and youth living in lower income neighbourhoods, as well as those living in households with lower educational attainment, were admitted to hospital more frequently. Over the past 10 years, asthma hospitalization rates remained about 1.5 times higher in the lowest-income neighbourhoods compared with the highest-income neighbourhoods. When it comes to education level, hospitalization rates were about double for children and youth living in households in which the highest level of education was less than high school, compared with those living in households in which it was a master’s degree or doctorate. This inequality was more pronounced for boys than for girls. Hospital Morbidity Database, Canadian Institute for Health Information. The causes and treatment of asthma are complex. According to the literature, there are several possible reasons for the differences in asthma hospitalizations. For example, lower income and education are associated with risk factors for developing asthma and triggering an asthma attack, such as smoking and poor housing quality. Effective asthma management also has many components, including adhering to medications that can be costly, avoiding asthma triggers and implementing an asthma action plan. “The decline in asthma hospitalizations over the past decade suggests that kids and parents are getting more of the support they need to manage their conditions. Yet there is still room for improvement to further reduce the extreme asthma events that necessitate a hospital stay,” said Kathleen Morris, vice president of Research and Analysis at CIHI. Health care decision-makers can use this updated information to identify where they can improve their health systems and health outcomes for Canadians. This is just the latest example of our work on health inequalities in Canada. Explore our suite of reports and interactive tools to shed further light on this issue.